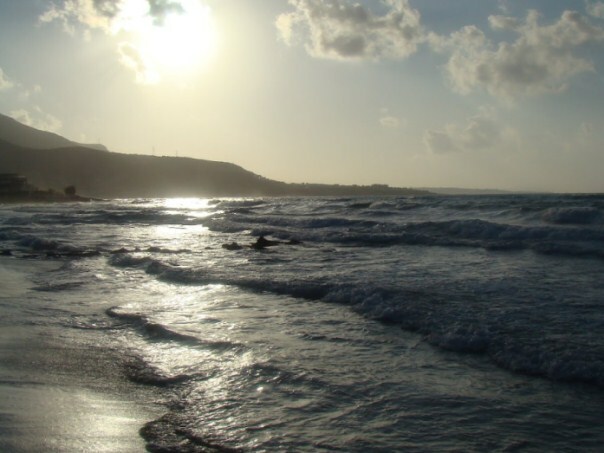 Stalida or Stalis beach is 31km east of Heraklion city, midway between Hersonissos and Malia. The tourist development on the south coast of Heraklion has resulted in the three resorts of Hersonissos, Stalida and Malia to become a unique coastal area, about 10 kilometers long. Overall, Stalida doesn’t offer the wild nightlife that Hersonissos and Malia do and as a result it is a perfect resort for families and couples alike. Umbrellas and sunbeds, showers, lifeguard, water sports, paragliding, parking, beach bars, restaurants, accommodation, mini markets, tourist shops, pharmacies, car and motorbike rentals, travel agencies for daytrips, ATM cash points. The beach is very long and gently shelves into the shallow sea, but on windy days you must be cautious and follow the lifeguard’s advice. Stalida beach is easily accessible from Heraklion with frequent public buses to Malia. The bus stops on the old National Road, thus you will have to walk about 500m to reach the beach. If you choose to drive from Heraklion, take the New National Road (E75), towards Agios Nikolaos, to the east. After about 27km, take the exit to Stalida/ Hersonissos and follow the signs.